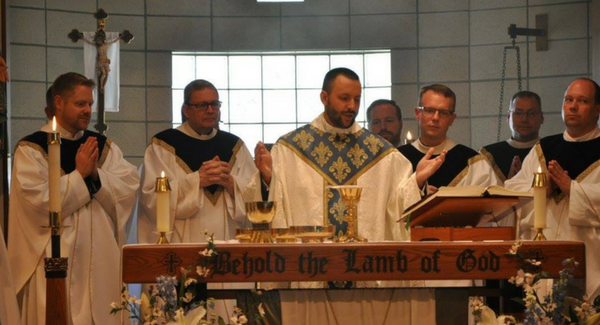 Alumnus Father Ed Herzog ’10, ’11, will fill the position of associate chaplain at Bishop Carroll Catholic High School (BCCHS) and parochial vicar at Christ the King Parish in Wichita, Kansas, beginning June 19. 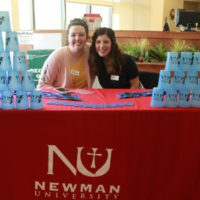 Herzog hails from New York and attended Newman University from 2007 to 2011. He received his bachelor’s degree in 2010 and his master’s in 2011, both in business administration. During his time at Newman, he was inspired to become a priest. Herzog’s main goal is to connect with students as a friend as well as a priest. 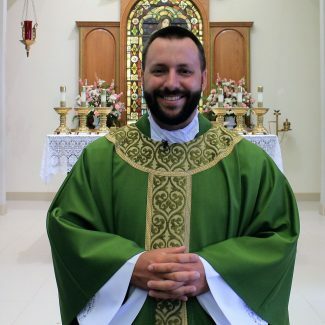 Being able to speak to a priest, especially about things like movies and sports, was a foreign concept to him as a young adult and he hopes that is not the case with his students. 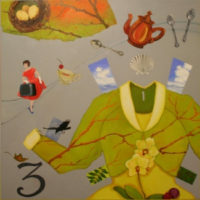 Noreen M. Carrocci, Ph.D. (center) stands with (l to r) Fathers J.D. 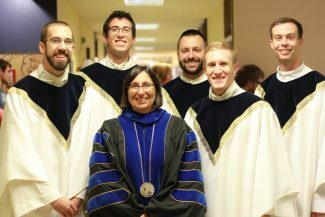 Betzen, Andrew Labenz, Edmund Herzog, Adam Grellinger and Kyle Dugan — all of whom are ordained priests and former Newman students. He will be working with students at BCCHS as well as the kindergarten through eighth-grade students at the parish. What may help Herzog relate to some students is the fact that he didn’t always find religion to be the epicenter of his being. During his high school years, he said attending Mass and learning about Jesus was seemingly boring. But he said that while in college, understanding the purpose of Jesus and the Church changed his view and ultimately, his life. He found that faith is “life-giving in the truest sense of the word” and he hopes to bring that same joy he encountered during his time at Newman to his students. Balancing time commitments at both BCCHS and the parish won’t be easy for Herzog, but he plans to take advantage of as many opportunities as he can. Saying no sometimes may be tough, but he knows it’s an inevitable part of splitting his time between two organizations. Though he looks forward to his new assignments, he is finding it hard to say goodbye to St. Margaret Mary Parish, his current assignment. “Preparing for the priesthood, I knew the hardest part of my life would be transitioning from one parish to another,” he said. He has built great relationships with individuals, families, students and staff in his one year at the parish and knows his new assignments will offer him the same opportunity. As a New York native, Herzog hasn’t had much experience with the parishes or schools in the Wichita Diocese. He said, “One of the first things I learned about Catholics in the city of Wichita is that there is a bit of a rivalry between Bishop Carroll and Kapaun (Mt. Carmel High School) — the two Catholic high schools here in Wichita. Being from outside of the diocese I have never had a dog in the fight so to speak, but I guess that is about to change here in the coming months.